This is a Hubble Space Telescope view of a small region of our galaxy where the host star to a gravitationally lensed planet (catalogued as OGLE-2003-BLG-235/MOA-2003-BLG-53) is located. The star is identified by the crosshatch at frame center. blowup of the target (lower left) reveals the light of two stars: a foreground star and a background star superimposed on each other. The background star is the brighter, solar type star, and the foreground star is the fainter star. In 2003, astronomers discovered a planet outside our solar system by measuring the way light from a distant star warped around the new world's host star. But it took two more years of telescope observations to actually see the host star. Using NASA's Hubble Space Telescope, astronomers have for the first time identified the parent star of distant planet discovered through gravitational microlensing. The new finding is expected to appear later this month in Astrophysical Journal Letters. Microlensing is a natural phenomenon that occurs when light from a distant star is bent and magnified by the gravitational field of a foreground star. The presence of a planet orbiting the foreground star causes the distant star's light to flare momentarily. In most cases, however, the planet's host star remains anonymous because its light is washed out by the brighter background star. 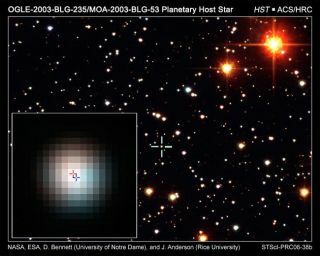 The foreground host star was finally spotted when astronomers looked at the crowded star field where the background star resides. They found that the background star looked about 20 percent brighter than expected. The additional brightness is likely from the foreground planet-hosting lens star, the researchers say. The two stars are so closely aligned relative to Earth that they look like one star. Hubble was able to resolve the two stars, however, by taking multiple images and using different colored filters. The space telescope recorded a color difference in the overlapping light of the two stars. Currently, the two stars are offset by only 0.7 milliarcseconds-the angular width of a dime seen from 3,000 miles away-but the brighter, background star appears slightly more reddish. The newly identified host star has been dubbed with the clunky moniker OGLE-2003-BLG-235L/MOA-2003-BLG-53L. It is a red dwarf star with about 60 percent the mass of the Sun and located 19,000 light years away. The identification of the host star "is crucial for a complete understanding of the planets discovered by microlensing," said David Bennet of the University of Notre Dame and leader of the Hubble team. Based on the new information, astronomers now think the new world they discovered in 2003 is about 2.6 times more massive than Jupiter. The planet is also believed to orbit its host star at about the distance Jupiter orbits the sun.